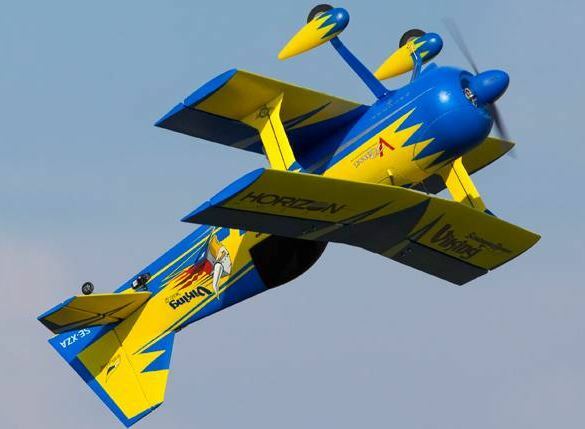 The E-fliteAS3X equipped Viking Model 12 280 model captures all of the stunningly bright colors of the trim scheme used on the full scale model,officially licensed by Jim Kimball Enterprises, Scandinavian Airshow and Aircraft Studio Design. This 280 sized model is constructed out of lightweight, molded foam. The 1800Kv brushless outrunner motor mates to a 10-amp speed controller. Add a 3S 450mAh LiPo and minimum four channel DSM2/DSMX transmitter and you are ready to take to the skies for unlimited aerobatics and extreme 3D maneuvers! The included Spektrum AR6335 6-channel 2.4GHz receiver features embedded AS3X technology, which helps to make this little biplane feel almost as locked in as the full size aircraft! Experienced park pilots and 3D pilots alike will want to grab this super-convenient and ideal aerobatic thrill machine! For additional media, information or to purchase, head on over to Horizon Hobby HERE!